Pablo Boczkowski, a professor of media studies at Northwestern University in Illinois, was visiting friends in Buenos Aires last week, and they mourned the five Argentines killed in a truck attack in New York. Grieving, his friends assumed the Oct. 31 attack would have caused a “collective psychosis” in the United States, Bockowski said. They asked him if he would "stop doing certain things" and telling his children not to go to certain places, he told NBC News. In the United States, the attack in New York added fuel to national debates about immigration and terrorism, after President Donald Trump condemned the diversity lottery visa program that the Uzbek man charged in the attack, Sayfullo Habibullaevic Saipov, used to enter the country. Saipov is accused of plowing a rented truck into bicyclists and pedestrians in lower Manhattan, killing eight people. In Argentina, a nation of immigrants in its own right, many have expressed shock that this kind of deadly mass attack — one that authorities said was inspired by the Islamic State — could hit so close to home. “From the outside, this situation acquires a certain level of broader impact," Boczkowski said. 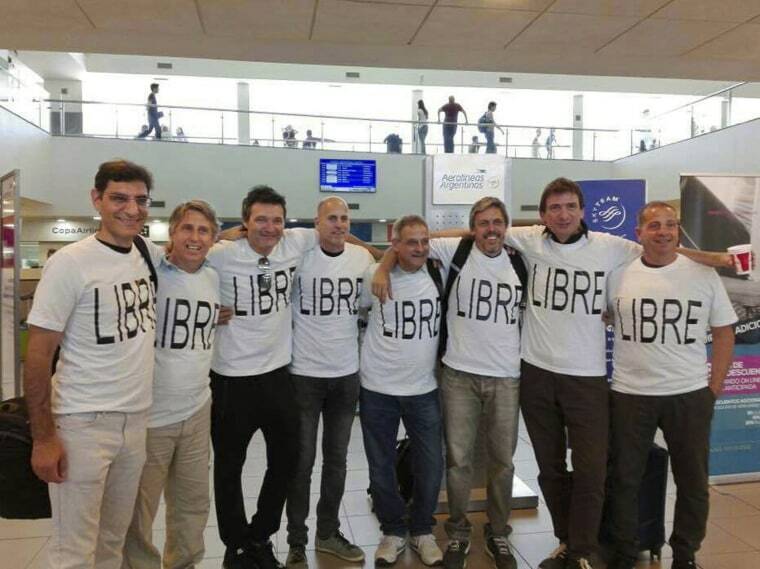 The five Argentine victims — Hernán Diego Mendoza, Diego Enrique Angelini, Alejandro Damián Pagnucco, Ariel Erlij and Hernán Ferruchi — were part of a group of high school classmates who were in New York to celebrate the 30th anniversary of their graduation. At a news conference last Friday, the four survivors in their group issued an emotional statement grieving the loss of their friends and the attack as a whole. "What has the world become? How could someone think of, plan and execute an act like this? It's unthinkable," the survivors said in the statement, read by one of them, Guillermo Banchini. For those on the outside, that word — "unthinkable" — was an appropriate way to characterize the truck attack. Reinaldo Laddaga, who grew up in Rosario, the city where the victims were from, said that he and others he had spoken with were shocked at the seeming randomness of the bikers’ death. The word “terrorism” in Argentina largely still refers to the kidnappings and murders committed by a military regime during the 1970s and 80s, when hundreds of political dissidents, students and members of the Left disappeared. But global conflicts fueled by the Islamic State or other terrorist forces have remained little more than news items out of the Middle East, the U.S. and Western Europe. Still, there are two notable exceptions of religiously fueled violence: Buenos Aires, the capital, suffered a set of bombings in the early 1990s targeting the city’s Jewish population, with one at the Israeli embassy in 1992 and another at a community center two years later. Agustín Zbar, the president of the Argentine-Israeli Mutual Association (AMIA), said that the New York attack was a potent reminder of the wounds of these bombings — and of a risk that he says has always been present for Argentine Jews. “The five Argentine citizens killed in the terrorist attack in New York are, regrettably, a kind of continuation of the 85 Argentines and foreigners who were killed here at AMIA,” he told NBC News. Zbar also mentioned the violent death of Reuben Eduardo Birmajer, an Argentinean rabbi who was fatally beaten in 2016 outside Jerusalem’s Old Gates. But Boczkowski said Tuesday’s attack struck a different chord, compared to both government kidnappings and the targeted bombings of Jewish institutions. For him, the kind of shock being felt in Argentina ultimately points to the ways he said the United States has come to treat terror attacks and other violent incidents. “It speaks about the culture, the inside/outside, how much we have normalized and accepted this contemporary condition," he said. As Boczkowski and his friends continued speaking, one suggested that they go on the same kind of group trip the victims had been on.